The personal composite trading instrument «&Finance_Stocks» reflects the price dynamics of the stock portfolio of 10 biggest companies from US finance industry which are traded on New York Stock Exchange (NYSE). The base part of this instrument is composed of stocks of American International Group, American Express, Bank of America, Citigroup, Goldman Sachs, JP Morgan Chase, Mastercard, Morgan Stanley, Regions Financial, Visa, Wells Fargo. The portfolio is quoted in USD. The component asset percentages in the instrument content are set approximately equal on the basis of asset prices in USD on the instrument creation date. The trading instrument &Finance_Stocks is used for the analysis and trade of the portfolio of US Finance industry stocks. This personal trading instrument &Finance_Stocks is used for the dynamics analysis and trade of the finance industry stock portfolio (the biggest US stock issuers), comparative analysis of this industry stock index with other stock indexes. 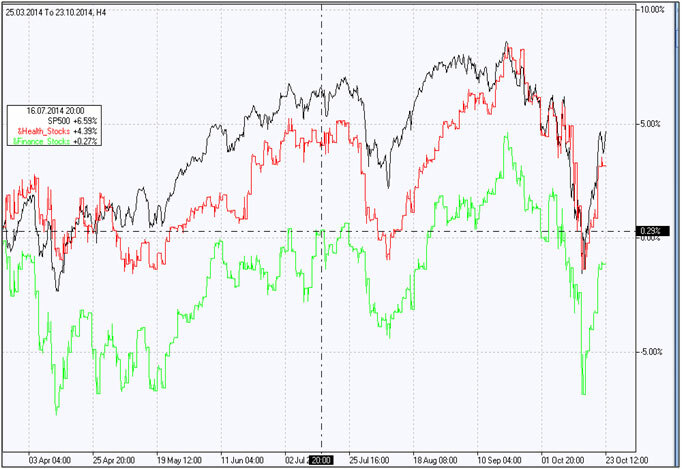 For example, by building an H4 percentage chart in the NetTradeX terminal for the broad stock index SP500, &Health_Stocks and &Finance_Stocks (Fig.1), it is evident that during the half year period (April-October 2014) the finance industry index steadily lagged behind the SP500 and healthcare industry indexes. Traders specializing in broad stock market and industry indexes will be comfortable trading this instrument. Limit volumes (USD) for base and quoted parts = 10000.00 ; 100.00.